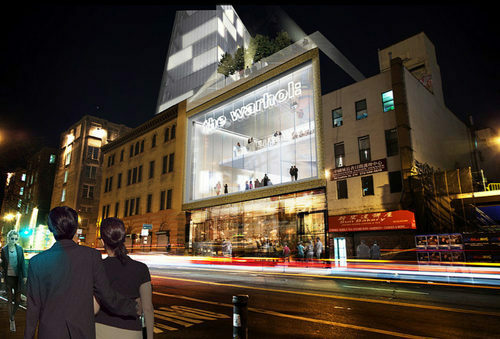 Is the International Center of Photography Coming to Essex Crossing? Nearly a year after the Andy Warhol Museum announced that it would not be part of Essex Crossing as planned, we’ve been wondering what other cultural institutions might plant their flag in the major new development rising out of ten sites around Delancey Street. Last night, at the project’s first public meeting of the year, an answer may have come out. Site 2, Essex Market entrance, Handel Architects. With the rumble of pile drivers now in full swing, it’s safe to say the Lower East Side is starting to feel the impact of the massive Essex Crossing development rising up out of the neglected parking lots of Delancey Street. Next week, the developers behind the project, Delancey Street Associates (DSA), are holding a public meeting to hash out concerns and details on construction and jobs. As the neighborhood gears up for the next phases of work and the imminent influx of new residents and business, we snagged some time with Katie Archer, DSA’s new director of community relations, so she could give us an overview of where the project stands. Lowline Edges Toward Reality, But What Does It Mean For the LES? “Lower East Side, not for sale!” “Chinatown, not for sale!” These were the chants on the streets of Chinatown two weeks ago, when protesters, huddled under umbrellas, marched to City Hall to demand the prevention of the 80-story tower currently planned for the East River waterfront. With more luxury apartments on the rise and the commercial landscape following suit, anxiety over the rapid gentrification of the Lower East Side is intensifying. The fate of six acres of vacant land at the corner of Delancey and Essex was finally revealed today. City officials and developers have dubbed the massive new multi-purpose development Essex Crossing, which, let’s be honest, kind of sounds like a mall in Ohio. Though it has a slightly more pleasant ring to it than SPURA (the Seward Park Urban Renewal Project), or the larger development project. Essex Crossing is the result of a in the battle between neighborhood residents and politicians over what to do with this gray patch of grit in the LES cityscape.